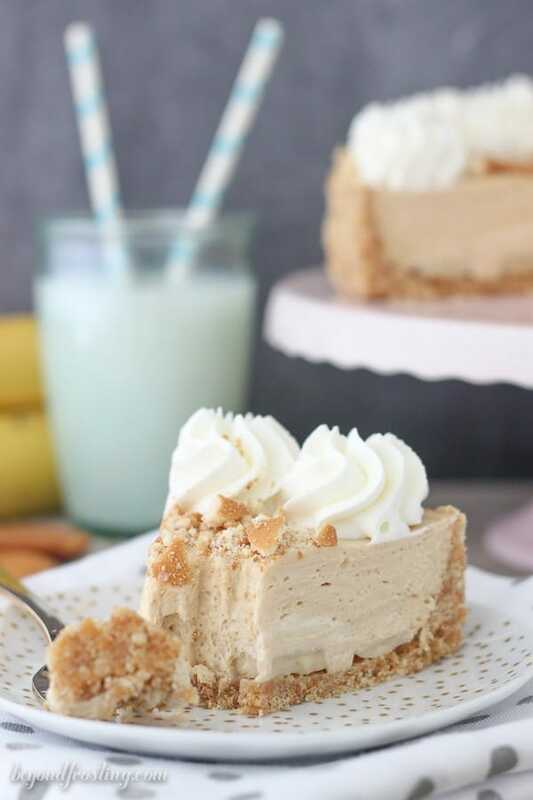 This No- Bake Peanut Butter Banana Pie has a Nilla Wafer crust with a layer of sliced bananas and a whipped peanut butter mousse filling. Normally I lead a pretty boring life. Other times, I am spinning in so many different directions that I can hardly keep my head on straight. Last week I was in Myrtle Beach for a small get together with some food blogging friends. This past weekend we jetted off to Lake Tahoe for a short snowboarding trip, soon I will be heading to Las Vegas and Phoenix. This month is absolutely crazy. I’ve been looking forward to our Tahoe trip for weeks. For the first time in a number of years, I’ve taken a bit of a break from snowboarding. I don’t know if I am getting too old to make the 6 hour drive every weekend or if I am complexly burned out from working on my book, my blog and my full-time job for the past few months. This trip was the perfect way for me to relax and recharge a bit. My boyfriend and I flew up on Thursday night and got 2 ½ days of riding in. When we got off the hill, we ate dinner and retired to our slope-side room for the night. It was literally 6:30pm and we were relaxing watching movies, or in my case, falling asleep. On Sunday, we got several amazing powder runs in before we had to leave to catch a flight. The snow was deep, 10 or more inches and a little bit heavy. We don’t get to ride powder very much, but this was kind of incredible. It was totally worth missing our flight over. Umm yea, that happened. The snow was absolutely “puking” (as we like to call it). all day, and all the way down the hill. So it took us way longer than expected. Luckily there was another flight an hour later and we were able to get on that one. It will be nice to be home for a few days before I head out again. On the way home from the airport, I was telling my boyfriend how I needed to write my post for today because it was Pi day. He said, “oh tomorrow is 3-14?”. I was so proud he even knew what I was referring to. In the food blogging world (and all those mathematicians-hi) today is one of the best holidays ever. It’s National Pi Day! Now if only my boss would give me the day off as I would really like to sleep in. On March 14th every year we celebrate our love for “Pi” or 3.14 whichever you prefer. 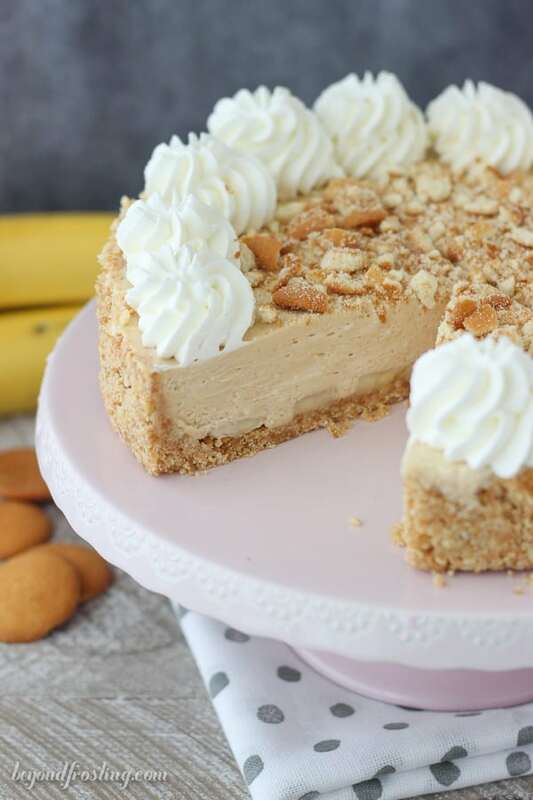 Last year I missed Pi Day, but this year I’m stepping it up with this Peanut Butter Banana Mousse Pie. Can I get a heck yea? Did I mention it’s no-bake? It recipes like these that make it particularly difficult for me to stick to my diet. 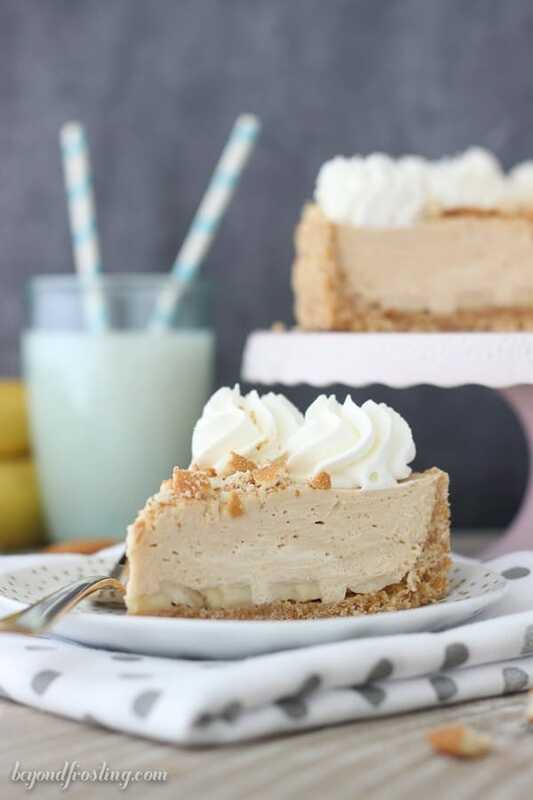 The silky peanut butter mousse is a whipped peanut butter cream layered with sliced bananas. I’ve picked Nilla wafers for the crust because they are a little sweeter than graham crackers and a better compliment to the filling. 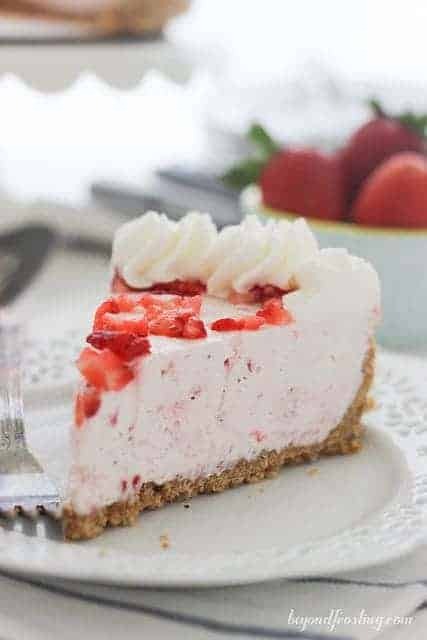 No-bake pies are my favorite pies to make. While I do love a traditional piecrust, it’s not my favorite to make. No-bake piecrusts take on a life of their own because of the variety of crusts you can make. 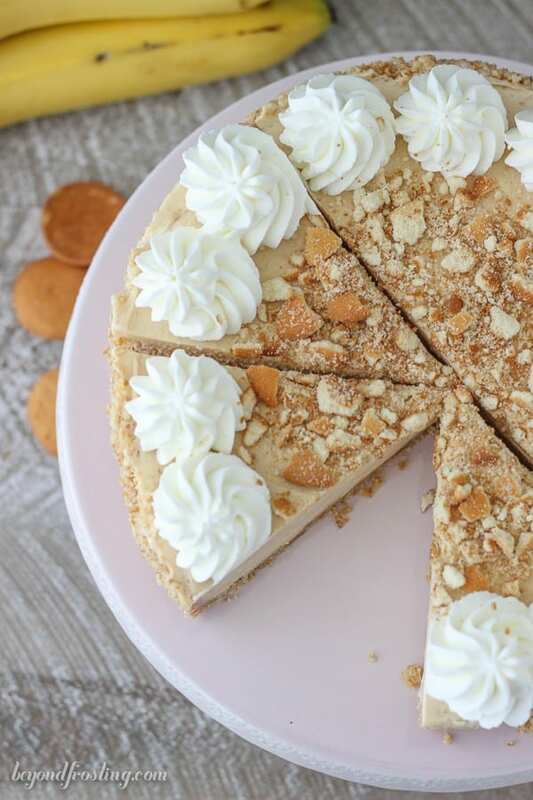 Think beyond your standard Oreo or graham cracker crust, get creative! The filling is to-die for. It’s a whipped peanut butter mousse. First I made the whipped cream and then I added the peanut butter and continued to whip it until soft peaks formed. Then just pour the filling over the bananas and pop it in the refrigerator. 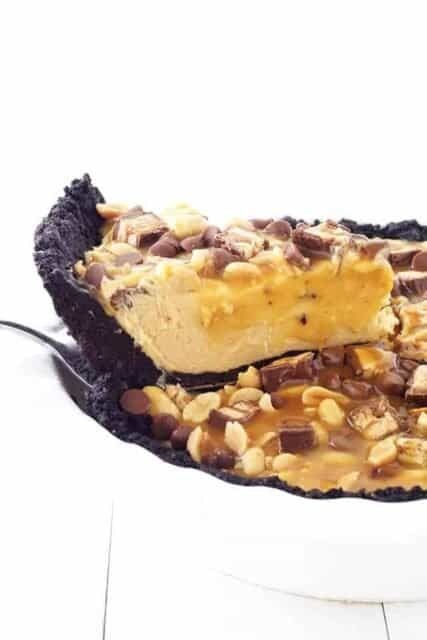 Once it sets or firms up a bit, you are left with the most wonderful, light and airy peanut butter filling. Someone pass me a spoon. 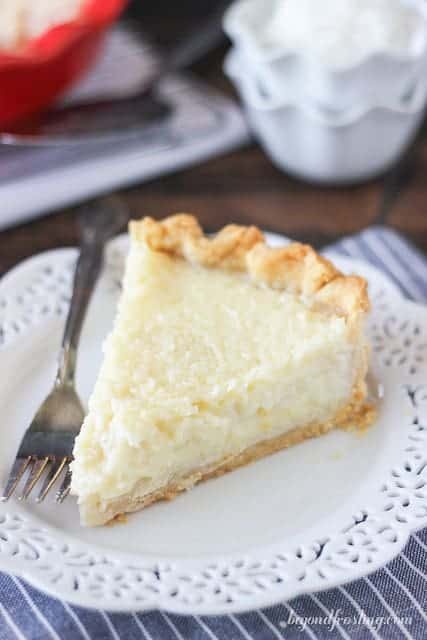 I hope your day is filled with Pi-e! Don’t forget to watch my quick trips for making the perfect no-bake crust! For the crust: grind the Nilla Wafers (save 4 wafers for the topping) into a fine crumb using a food processor or blender. In a small bowl, melt butter in the microwave 30 to 45 seconds. Pour the melted butter over the Nilla Wafer crumbs and stir until the crumbs as well coated. Line the bottom of a 9-inch spring form pan with parchment paper. Press the crumbs into bottom and up the sides of the pan. Refrigerate the crust until the filling is prepared. Slowly pour the heavy whipping cream slowly, about ¼ cup at a time so that the cream cheese turns to liquid. Once all the heavy cream has been added, increase the mixing speed to medium-high and slowly add powdered sugar until soft peaks form. Turn off the mixer and add the creamy peanut butter. Beat the peanut butter into the whipped cream on high speed until stiffer peaks form. 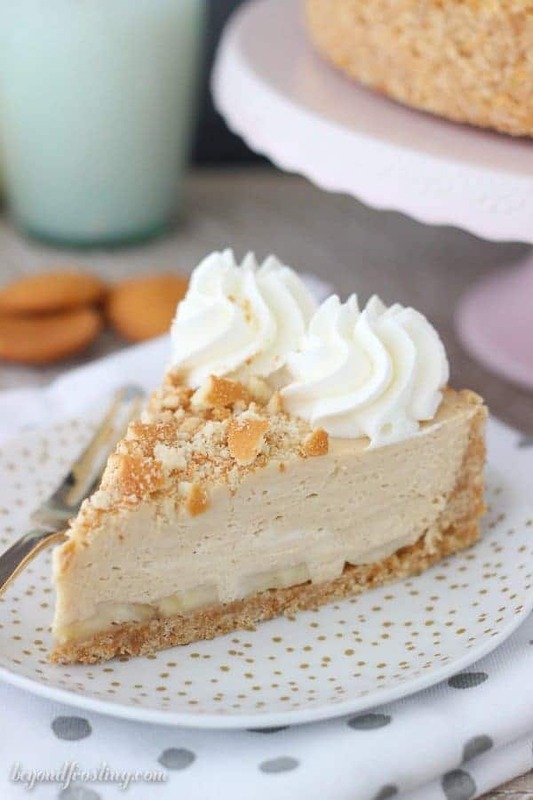 Remove the crust from the refrigerator and slice bananas in a single layer on the bottom of the crust. Pour the peanut butter filling over the sliced bananas. Refrigerate the pie for 3 to 4 hours until the filling is more firm. Prior to serving, add the whipped cream topping. Add the powdered sugar and beat on medium high until stiff peaks form. 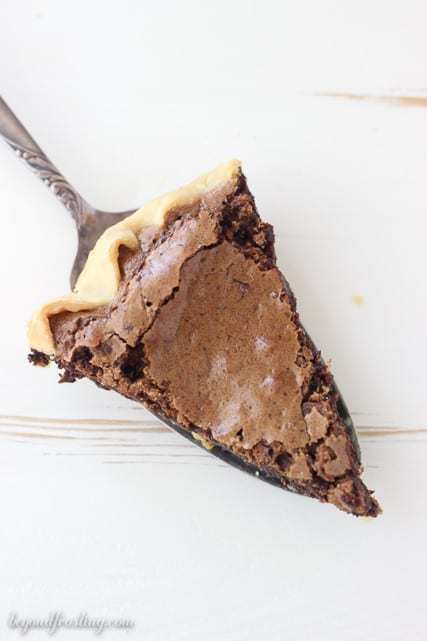 Using a large star tip, pipe the whipped cream along the edges of the pie. 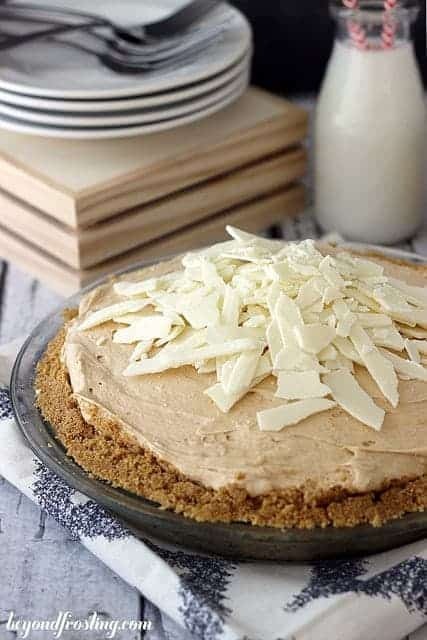 Crush the remaining Nilla wafers and sprinkle over the top of the pie. Can this be made the night before, or will the crust get soggy? Thanks! My hubby loves any good PB/banana combo! Hi Angel, absolutely!! It can be made in advance. Making with a Reese’s puff cereal crust. Oh my gosh!!! I love that idea! You got that right!! Thank you for stopping by! Hope you had a happy Pi Day! And it sounds like your life is pretty crazy right now. At least you’re getting in some good trips and time with friends, somewhere in between all that blogging and book writing and working at your day job. A nap DOES sound nice, doesn’t it? Thank you Mir! I do love all the traveling but it is SO nice to just be home! Who was the lucky person who got to “test” this one? Yummmmmmmmmm-oh! My coworkers mostly LOL, but they will try just about anything I make! 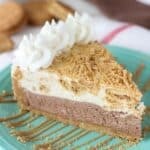 I love no bake pies or desserts too! The filling is so creamy! Me too Joanne! They are just SO easy!